Commonly called Sien Hoornik, Clasina Maria Hoornik (1850–1904) lived with van Gogh during much of his time in The Hague from 1881 to 1883. Van Gogh used Sien, a pregnant prostitute, as a model for his work and later took Sien and her daughter into his home. Van Gogh made drawings and paintings of Sien and her daughter, baby and mother over that period, which reflected the domestic life and hardships of the working poor. Their relationship was not accepted by his family or supporters, although his brother Theo did not withdraw his support over it. It did contribute undoubtedly, however, to a split with Anton Mauve, a cousin-in-law and noted painter of the Hague School, who had introduced van Gogh to painting as well as supporting him financially, and whom van Gogh revered. At his brother Theo's urging, van Gogh left Sien in 1883 to paint in Drenthe, ending the only domestic relationship he would ever have. Sien resumed her life as a seamstress, cleaning woman and likely prostitute before marrying in 1901. On 12 November 1904, aged 54, she threw herself into the Schelde river and drowned, fulfilling a prediction she had made to van Gogh in 1883: "what the bad moods are is still more desperate ... 'it's bound to end up with me jumping into the water.'" In the summer of 1881, van Gogh fell in love with his recently widowed first cousin, Kee Vos Stricker. He proposed marriage, but was rebuffed with an adamant "no, nay, never" ("nooit, neen, nimmer"). Undeterred, he nevertheless continued to press his attentions despite the increasing dismay and disapproval of his family which eventually led to his leaving the family home for a while to study drawing at The Hague with his cousin-in-law Anton Mauve. Mauve was a successful and noted artist, a leading member of the Hague School and a master colorist whose paintings found a ready market both home and abroad. He had married van Gogh's cousin, Ariëtte (Jet) Carbentus, in 1874 while she was still very young and he was already established and successful, and as such was lionised by the van Gogh family. At the time, he was busy with his massive Fishing Boat on the Beach that he was preparing for the next year's Salon, but he nevertheless found time for van Gogh to advise him on his drawings, inviting him to return in a few months time to review progress. After a last, humiliating effort to win Kee over, an episode that severely rocked his religious faith, van Gogh returned to his parents' home in Etten in late 1881. On Christmas Day that year, he refused to attend church, provoking a violent quarrel with his father, a pastor, which resulted in his leaving home the very same day. He returned to The Hague and studied further under Mauve. Mauve helped him to establish a modest studio on the Schenkweg on the outer fringes of The Hague, lending him money to purchase furniture, and introduced him to the Pulchri Studio, The Hague's most important art society in which he himself played a major role. He also introduced van Gogh to painting, first in oils and then with watercolor. At the end of January 1882, on his own account, van Gogh met a homeless, pregnant, prostitute named Clasina (Sien) Maria Hoornik who had been deserted by the father of the child she was carrying. The exact date of this meeting is not known beyond van Gogh's dating of it in a letter to Theo written in May. However, another letter written mid-January mentions he was negotiating modelling with "a mother with a little child" and it does seem plausible this was Sien. It has also been suggested that the woman he "found" following his humiliating rejection by his cousin Kee Vos, as described in a letter to Theo around 23 December the preceding year and immediately before his final estrangement from his father that Christmas Day, was in fact Sien, although there is no direct evidence for the surmise. Based on the dates, van Gogh could not have been the father of the child. Sien was born in 1850, the eldest of ten children of Pieter Hoornik, a porter in the poor district of the Geest, and his wife. Pieter died in 1875. To provide for the family, Sien and her mother worked as seamstresses and cleaned homes. Their earnings were supplemented by what Sien's brother, Pieter, could provide from the income of his chair-making business. The family often relied upon public assistance. For a time Sien and some of her siblings lived at a Catholic orphanage, relying on assistance from the public soup kitchen and church charities. So meager were her earnings, she turned to prostitution for a better income. By the age of 32, the unmarried Sien had given birth to four children, two of whom lived: Maria Wilhelmina, born about 1877, and Willem, born July 1882. Sien experienced poor health due to the post-operative effects of earlier surgeries, illness, and venereal disease, which she seems to have passed to van Gogh, who was hospitalized in June 1882 for gonorrhea. Sien posed for van Gogh throughout the winter. In exchange, van Gogh provided Sien and her daughter with a place to live and food to eat. Sien was ill when he met her and he did what he could to nurse her back to health. Van Gogh considered marrying Sien to take care of her and keep her off the streets. He envisioned a life where Sien would be his helpmate, helping him further his artistic career. Sien wanted to be married to him, too, even though he was poor. His family, including his brother and supporter Theo, opposed the relationship and his hope for continued support was doubtful. In June 1882, van Gogh was hospitalized for gonorrhea. Disobeying doctor's orders, he left the hospital July 1 to visit Sien in Leiden, where she had just given birth to a baby boy. Van Gogh moved to a larger studio next door with Sien and her two children. Sien required an extended period of recovery from a difficult pregnancy and delivery. The baby boy, though, seemed to bring much happiness to van Gogh. He explained that while he endeavored to go deeper as an artist, he was also looking to do so as a man. Anton Mauve – Ariëtte (Jet) Carbentus, the Artist's Wife, in the Dunes. Jet Carbentus was a cousin of Van Gogh on his mother's side. As a result of his relationship with Sien, van Gogh experienced the loss of support and goodwill from family and friends and his relationship with his parents was further strained. His teacher and cousin-in-law, Anton Mauve, abruptly ceased his support and tutelage within a few weeks of Van Gogh first meeting Sien, although there were other factors involved as well, not least their mutual melancholy. Hulsker called this a simple tragedy for van Gogh. Likewise, a long-standing family friend, Hermanus Tersteeg, an influential art dealer who taught Vincent and his brother Theo a great deal about art and literature, and who gave Vincent his first set of art supplies when he decided to become an artist, although he was always somewhat equivocal in his support, abruptly withdrew at the same time. People suspect me of something... it's in the air... I must be hiding something... Vincent is keeping something back that may not be divulged.. Well, gentlemen, I’ll tell you – you who set great store by manners and culture, and rightly so, provided it's the real thing – what is more cultured, more sensitive, more manly: to forsake a woman or to take on a forsaken one? Van Gogh left Sien the autumn of 1883 and went to Drenthe to paint. Sien went back to work as a seamstress, charwoman and possibly as a prostitute. Her children, Maria and Willem, lived with Sien's mother and brother Pieter. In 1901, Sien married a seaman, Anton van Wijk. She committed suicide in 1904 at the age of 54 in Rotterdam's harbor, 14 years after van Gogh's death. Throughout his career, van Gogh made few portraits of his close artistic friends or family members. In particular, no portraits were thought to exist even of his brother Theo, by far the closest to him. However, in 2011, the Van Gogh Museum's senior researcher, Louis van Tilborgh, announced that he was satisfied that one of the many self-portraits by Vincent van Gogh is in fact a portrait of his brother Theo. His conclusion was based on a number of striking differences between their features. Theo's portrait, made in 1887, shows a man with shaved cheeks. Theo's beard is not red like Vincent's, but more ochre. On top of that, this man's ear has a fine rounded shell, unlike Vincent's but like Theo's. Vincent had a particular interest in painting families of the working class, as seen in The Potato Eaters, his The Roulin Family series. He was influenced especially by the social realism of the English illustrators, such as Hubert von Herkomer, Samuel Luke Fildes, and Frank Holl, working for The Graphic, a British weekly illustrated newspaper founded by the social reformer William Luson Thomas. Van Gogh frequently referred to them in his letters, and he had obtained a complete set of back numbers of The Graphic between 1870 and 1880, decorating his studio with his favourite prints. By September, Sien had recovered from her difficult confinement and was ready to pose again. At the same time, van Gogh had discovered his orphan man, Adrianus Jacobus Zuyderland, who was to become his favourite and most patient model. With the winter drawing in and working outdoors increasingly difficult, van Gogh retreated to his studio and returned to drawing figures. He used the remaining canvas from his work in oils to shutter his windows and adjust the light falling on his models. The works of Sien, a 32-year-old prostitute and seamstress, often depict her in traditional domestic feminine roles: a mother, seamstress, and domestic worker. 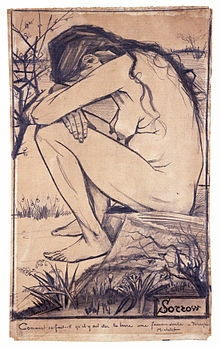 In the drawing Sorrow (F929, F929a) and a subsequent lithograph (F1655), Sien represents a woman's sorrow and frailty. Some of the works are iconic, such as Woman Seated (F935, JH143) and Mother with Child. When van Gogh made drawings of Sien sewing, the compositions were simple as was her work. If she had been in a higher station in life, a painting of her sewing would no doubt have shown her performing embroidery. Rather than being an activity for enjoyment, Sien's sewing was one of drudgery. Regarding Woman Seated, it is curious that he posed Sien in a dress identical to one worn by Kee Vos Stricker, as can be verified by the photograph of Kee Vos and her son catalogued in the Dutch national archive Geheugen van Nederland and held in the collection of the Van Gogh Museum, Amsterdam (reproduced top left). In a letter van Gogh mentioned how he considered Sien his helpmate or partner in the creation of the works which depicted her. He would write Theo about his relationship with Sien, saying that it wasn't exactly love between them but rather a mutual understanding. Vincent took Sien off the streets and provided for her and her children, and in return she posed for him. Sien with Umbrella and Prayer Book, pencil, black chalk, 1882, Private collection, (F1052, JH101). The signature at the lower left is false. Hulsker considers this to be one of the earliest Sien drawings. Quite poor, Sien's family often relied upon the public soup kitchen for food. Hulsker called the signed drawing The Public Soup Kitchen (F1020a below) important and attractive. Van Gogh and his contemporary George Hendrik Breitner had sketched together at a soup kitchen in the Geest (it is not known which of the several possibilities it was). After going to the trouble and expense of installing shutters in his windows to adjust the light and to recreate the scene itself in his studio, van Gogh was able to study his models at leisure. In this way he was able to introduce more chiaroscuro (light and dark) in his drawing, which he executed with the natural ('mountain') chalk that Theo had sent him and whose properties he lauds in his letters. All the models are from Sien's family: her mother and baby on the left, her sister, back turned, and her daughter, hair cropped as a precaution against lice, in the center, with Sien herself, superbly executed in profile, on the right. The watercolor F1020b (below) is much less successful as van Gogh himself acknowledged, blaming the paper in part for not being right for the job. ^ Hughes, Robert (27 October 2005). "The genius of Crazy Vinnie". The Guardian. Retrieved 23 February 2012. ^ a b "Letter 224: To Theo van Gogh. The Hague, on or about Sunday, 7 May 1882". Vincent van Gogh: The Letters. Van Gogh Museum. Today I met Mauve and had a very regrettable conversation with him which made it clear to me that Mauve and I have parted ways for ever. ^ Naifeh and Smith (2011) pp. 281-285 ff. ^ a b Brooks, D. "Woman Sewing, with a Girl". The Vincent van Gogh Gallery, endorsed by Van Gogh Museum, Amsterdam. David Brooks (self-published). Retrieved 23 February 2011. ^ a b Naifeh and Smith (2011) p. 240, p. 253 ff. ^ Brooks, D. "The Van Gogh Family Tree". The Vincent van Gogh Gallery, endorsed by Van Gogh Museum, Amsterdam. David Brooks (self-published). ^ a b c "Letter 228: To Theo van Gogh. The Hague, on or about Tuesday, 16 May 1882". Vincent van Gogh: The Letters. Van Gogh Museum. Note 7. "O God, there is no God!"... at the end of January I met Christien. ^ "Letter 196: To Theo van Gogh. The Hague, on or about Tuesday, 3 January 1882". Vincent van Gogh: The Letters. Van Gogh Museum. Paragraph 3. Mauve lent me some money, 100 guilders, to rent it, furnish it and get the window and light fixed up. ^ "To Theo van Gogh, The Hague, on or about Thursday, 6 April 1882". Vincent van Gogh: The Letters. Van Gogh Museum. Retrieved 23 February 2012. ^ "Letter 193: To Theo van Gogh. Etten, on or about Friday, 23 December 1881". Vincent van Gogh: The Letters. Van Gogh Museum. Note 16. I found a woman, by no means young, by no means pretty, with nothing special about her, if you will. ^ a b c "Letter 227: To Theo van Gogh. The Hague, on or about Tuesday, 16 May 1882". Vincent van Gogh: The Letters. Van Gogh Museum. Note 7. I met Christien, as you know, when she was pregnant, ill, in the cold — I was alone — I had just had that experience in Amsterdam I wrote to you about. ^ Harrison, R, ed. (2011). "Vincent van Gogh. Letter to Theo van Gogh. Written 14 May 1882 in The Hague". Van Gogh Letters. WebExhibits. Retrieved 2011-05-18. ^ a b Harrison, R, ed. (2011). "Vincent van Gogh. Letter to Anthon van Rappard. Written 4 February 1883 in The Hague". Van Gogh Letters. WebExhibits. Retrieved 2011-05-18. ^ "IB-nummer 117003". RKD databases. Rijksbureau voor Kunsthistorische Documentatie (RKD). Archived from the original on 2011-07-24. ^ "Van Gogh and Tersteeg". Permanent Collection. Van Gogh Museum. 2005–2011. Retrieved 23 February 2012. ^ "Fishing boat on the beach". RKD databases. Rijksbureau voor Kunsthistorische Documentatie (RKD). ^ Naifeh and Smith (2011) p. 254 ff. ^ "Letter 219: To Theo van Gogh. The Hague, on or about Friday, 21 April 1882". Vincent van Gogh: The Letters. Van Gogh Museum. I then said to Mauve, old chap, don’t speak to me of plaster casts any more, because I can’t stand it. ^ "Letter 309: To Anthon van Rappard. The Hague, between about Tuesday, 12 and Sunday, 17 September 1882". Vincent van Gogh: The Letters. Van Gogh Museum. ^ "Research shows one of Vincent van Gogh's self-portraits is in fact Theo". Retrieved October 21, 2011. ^ a b Zemel, 17. ^ "Letter 199: To Theo van Gogh. The Hague, Sunday, 8 or Monday, 9 January 1882". Vincent van Gogh: The Letters. Van Gogh Museum. ^ "To Theo van Gogh. The Hague, Monday, 1 May 1882". Vincent van Gogh: The Letters. Van Gogh Museum. Retrieved 23 February 2012. ^ "Kee Vos met zoon Jan (photo)". Geheugen van Nederland. Retrieved 26 February 2012. ^ "Woman ('Sien') seated near the stove". Kröller-Müller Museum. Retrieved 23 February 2012. ^ "Woman Seated". Kröller-Müller Museum. Retrieved 23 February 2012. ^ Brooks, D. "Bent Figure of a Woman (Sien?)". The Vincent van Gogh Gallery, endorsed by Van Gogh Museum, Amsterdam. David Brooks (self-published). Retrieved 16 February 2011. ^ "To Theo van Gogh. The Hague, on or about Thursday, 29 March and Sunday, 1 April 1883". Van Gogh Museum. Retrieved 23 February 2012. I’ve already written that I’ve drawn with the natural chalk – yesterday I began a second drawing with it, a woman sewing. Particularly with an eye to chiaroscuro. ^ "Letter 323: To Theo van Gogh. The Hague, on or about Saturday, 3 March 1883". Vincent van Gogh: The Letters. Van Gogh Museum. ^ a b "Letter 324: To Theo van Gogh. The Hague, on or about Sunday, 4 March 1883". Vincent van Gogh: The Letters. Van Gogh Museum. This page was last edited on 30 November 2018, at 04:57 (UTC).